Geotag Silt Fence is a temporary measure to help in erosion control in many construction activities and disturbed embankments. Most of the time during constructions, the ground is often disturbed or left bare that is vulnerable to weather erosion. During rainy seasons, the storm water can cause a situation of pipes and manholes blockages which then resulted in unnecessary flooding and damage to property and contamination of rivers and streams. With the help of the Geotag Silt Fence, it can filters from both run off water and fast running water by allowing sediments or soil to be trapped while the water flow out. This helps to prevent loss of valuable soil from the area. Geotag Silt Fence is easy to install, cost effective and helps to prevent water pollution. Wall tag supplies Silt Fence in Singapore. Kindly contact us for quotation. Geotag Silt Fence is manufactured from high quality UV stabilized woven geotextile ensuring the highest quality and consistency. Geotag Silt Fence has been designed and manufactured to meet all sediment control requirements. 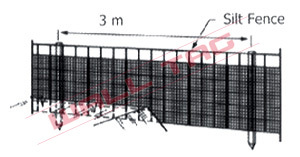 The Geotag Silt Fence can be installed as an entrenched vertical perimeter barrier fence and is designed to intercept and detain run-off, trapping harmful silt through settlement and filtration before it leaves the site.